Suddenly all that seems to matter to markets is when the Fed will end its quantitative easing (QE) program. With quantitative easing, the Fed buys large amounts of mortgage-backed and Treasury bonds - currently at an $85 billion per month pace - in an effort to reduce long-term interest rates and encourage investment. Although a debate is still underway on whether the QE has boosted growth in the real economy, few doubt that the injection of massive amounts of liquidity into the markets had helped propel stocks and bonds upward. 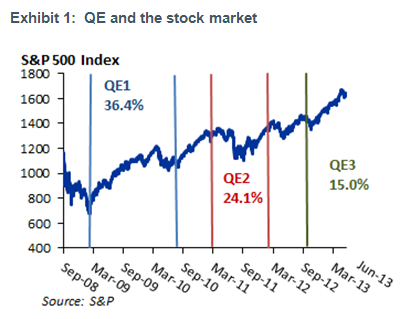 The stock market had risen during all three of the Fed's QE programs since 2008. Treasury yields fell - down to a low of 1.43% on 10-year notes in July of last year, and yield spreads on corporate bonds, mortgages, and emerging market debt all came in. But if the provision of massive liquidity was boosting markets, what would happen when the Fed no longer engaged in quantitative easing? The markets' judgment, when it came, was harsh. Comments by Fed Chairman Ben Bernanke last month that the central bank could decide to reduce the pace of its bond purchases "in the next few meetings," which were echoed later by other Fed officials, roiled the markets. Yields on 10-year U.S. Treasuries rose 59 basis points in 30 trading days, the largest rise in yields in 28 months, and mutual funds that invest in long-term Treasury bonds lost an average of 6.8% in May, according to Morningstar, wiping out years of interest income. The sell-off continued into June and accelerated after Ben Bernanke's press conference following the June 18-19 meeting of the FOMC, the Fed's policymaking body. The Fed Chairman said that the Fed could decide to taper off its bond purchases in December of this year and end them by mid-year 2014 if it believes that the economy is strong enough to withstand it. But the Fed had also raised its forecasts for growth, and the markets - correctly or not - began to price in an end to QE. The rise in Treasury yields sent shock waves throughout markets that had done well in recent years as investors had stretched for yield, with rates spiking on mortgages, corporate bonds, emerging market debt, and European government bonds. Several emerging markets suddenly found their currencies under pressure, forcing central banks in India and Poland to intervene in foreign exchange markets and the central banks in Brazil and Indonesia to raise interest rates. Meanwhile, Japan's stock market, which had risen a stunning 80% between end-October 2012 and May 22 of this year in anticipation of an easier monetary policy, lost 20% of its value in the three weeks ending June 14. The sell-off in the Nikkei appears to be related to concerns about the government's commitment to reform and not the rise in U.S. Treasury yields, but the volatility has added to a sense in global markets that investment theses need rethinking. Following the 2008 financial crisis and accompanying recession, investors had resigned themselves to a "new normal" of slow growth, persistent unemployment, and high government debt burdens. In the United States, once the recession - and a fiscal stimulus package -came to an end, the focus of policy shifted to government spending cuts (especially at the state and local government level) and monetary ease, including quantitative easing and a pledge to keep the Fed funds rate low. The implication was that interest rates, including yields on long-term bonds, would fall as long as those policies remained in place. For the United States this meant that the bull market in bonds, which began in August 1981 when the market began to believe that the disinflationary efforts of the Fed under Chairman Paul Volcker would work, would continue. Yet there were always skeptics. Many observers could not bring themselves to believe that yields on 10-year Treasuries below the inflation rate - and a negative yield on TIPS (Treasury Inflation-Protected Securities) - were sustainable. Any return to trend-like GDP growth and the resulting rise in credit demand would surely lead to higher interest rates. Others simply noted that long-term interest rates had fallen so low that there was little scope for further declines. Even as investors were buying Treasuries at the beginning of this year at yields not much above their historical lows, they were pricing in a rise in rates. The Treasury yield curve at the turn of the year implied a rise in one-year bond yields from 0.15% to 0.39% by the end of the year 2013, and a rise in 5-year Treasury yields from 0.77% to 2.27% in five years. (The Treasury market is now looking for 5-year yields to rise to 3.82% in five years.) In light of these concerns, the sell-off in global markets is not hard to understand. 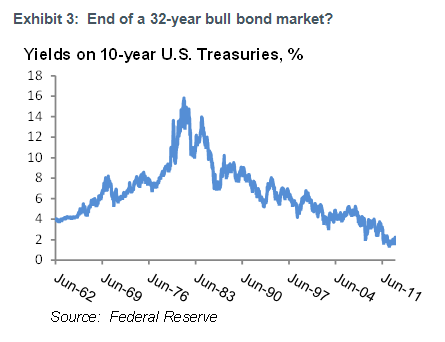 Any investor persuaded that a sea change has begun and the decades-long bull market in bonds is coming to an end, would rationally move out of those asset classes that have benefited from extraordinary low rates. But is this reaction warranted? Investors who were quick to sell Treasuries in the past few days may have been seeking to avoid a replay of the 1994 rout in the U.S. Treasury market. In February 1994 the Fed began a tightening round, raising the Fed funds rate six times, including two hikes of 50 basis points and one of 75 basis points. The bond market tanked, with the 30-year Treasury bond losing 20% of its value by the end of the year. Virtually no asset class escaped the bloodbath (though stocks wound up no worse than flat on the year), and cash was the best place to hide. While large market dislocations are always instructive, the 1994 tightening differs from the likely course of monetary policy today in a number of important ways. First, the Fed is contemplating a tapering off of its purchases of bonds, not a tightening of monetary policy of the kind that would require a rise in the Fed funds rate. The Fed has linked any future rise in the Fed funds rate to economic conditions. Specifically, it has said that it will not raise the Fed funds rate until the unemployment rate falls below 6.5% provided the outlook for inflation does not rise more than 0.5% above the Fed's 2% target. With the unemployment rate at 7.6% and the core Personal Consumption Expenditure index (the Fed's preferred inflation measure) rising at an annual rate of only 1.05% in April - the lowest rate in the history of the series - the economy is many quarters away from reaching those benchmarks. The markets believe a rate hike is unlikely until 2015: As of June 14, the Fed funds option market was pricing in a 50% probability of a hike in the Fed funds rate to 0.50% in April 2015, and a probability of only 35% that the Fed funds rate will be that high by December 2014. A second difference is that in 1994, the Fed surprised the markets and wanted interest rates to be higher. In contrast, in recent years the Fed has gone to considerable lengths to provide more guidance to the markets about its policy stance and the circumstances under which it would change. In 1994, the Fed thought the economy was operating near full capacity; today it is not clear that the Fed is convinced that the economy is strong enough yet to withstand higher interest rates. Moreover, it has reserved to itself the right to reverse any tapering of bond purchases if interest rates back up too quickly. While the options market allows us to infer the probabilities of what future Fed funds rate may be, no mechanism exists for measuring the market's expectations of the pace at which the Fed may taper off its bond purchases. Respondents to a New York Fed survey of primary government securities dealers in late April, however, revealed a median expectation that the Fed would maintain its $85 billion per month bond purchases through December of this year, but would end those purchases altogether by 2Q 2014. J.P. Morgan's interest rate strategy team estimates that the 10-year Treasury yield would rise 28 basis points in response to a complete cessation of bond buying.1 Our view is the risk is that yields would rise further than that, with most of the impact resulting from a rise in the term premium - the difference between the level of long-term rates and the expected future path of short-term rates - as the market becomes relatively less certain about policy. Unless the Fed surprises the market and ends QE sooner than expected, however, we expect the rise in rates to be much more modest than in past episodes of actual tightening. Over the next few quarters markets are likely to continue to struggle with the prospects for a tapering of QE in the United States. QE, however, is not the only reason the stock market has risen to new highs: Strong earnings have played a role too. Earnings growth for the S&P 500 companies has been strong since the end of the 2008-09 recession, and as of last week forward earnings (a time-weighted average of current earnings and next year's estimated earnings) for the S&P 500, S&P 400, and S&P 600 stocks are at an all-time high. Despite concerns about revenue, growth profit margins have remained strong, and as of late May the consensus estimate among analysts for 2014 was that the profit margin on the S&P 500 would be a hefty 9.9% this year, up from 9.4% last year. Despite the recession in Europe and weaker growth in the emerging markets, large-cap U.S. corporations have found ways to make and grow profits. The consensus economic outlook for the United States, with which we broadly agree, is for continued slow growth that will accelerate gradually to a trend-like 3% real GDP growth rate by the end of 2014. The main drivers of this growth are the housing sector, that continues to recover, and consumer spending that continues to hold up. 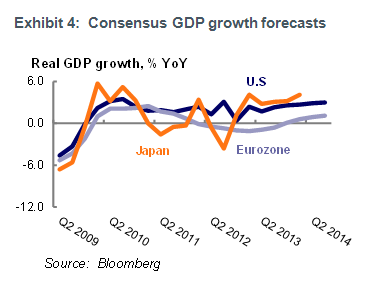 The outlook for growth abroad, meanwhile, is brightening a bit. The consensus forecast is that Europe will emerge from recession this year, and growth in Japan will accelerate in response to monetary easing and an end, finally, to concerns about deflation. Growth in the emerging markets, especially China, will remain below par until growth in the developed countries is on a firmer foundation, which may keep pressure off commodity prices. Consumer price inflation is likely to be contained for several more quarters in most countries. In this environment of slow but improving global growth we recommend favoring stocks over bonds, especially long-term Treasuries, where despite the recent rise in yields, prospective returns do not compensate for risks, in our view. The main risk is that the market overreacts to the winding down of QE. While central bankers often promise to change policy gradually, events have a way of unfolding in anything but a gradual manner. The risk that inflation picks up suddenly and the Fed has to slam on the brakes, meanwhile, cannot be ruled out altogether, though that is not our base case scenario. 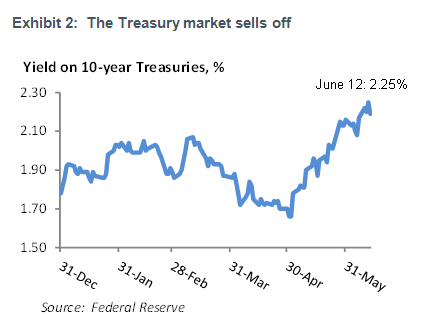 Although bonds that trade at a spread over Treasuries did not fare well in the sell-off of the past few weeks, we continue to believe that they will be in a better position to weather any turbulence in the bond markets. With earnings growth still strong we believe equities are a better place to be than fixed income. Within the United States we continue to maintain a modest shift toward value stocks while retaining a slight overweighting in growth. Value tends to outperform growth unless financials, which are typically lodged in the value indices, are troubled. But the financial sector has been recovering, and is likely to continue to do so barring a slip back into recession, which we view as unlikely. It may be early, but valuations in overseas markets are attractive enough to make an easing into some of those markets soon, especially in Europe and Japan, tempting. Forecast P/E ratios for 2013 and 2014 for Europe are below those for the United States, and Japan - long the land of lofty valuations -now has P/E ratios no higher than those in the United States. We would hesitate to recommend moving aggressively into the emerging markets, however. That asset class is especially vulnerable to any rise in interest rates in the developed markets: Capital that flows into the emerging markets in search of higher yields when interest rates and growth are low in the developed countries, flows right back out when rates and growth pick up, seemingly without regard to developments in the emerging market countries themselves. For example, during the two weeks ending June 12, investors pulled $15 billion out of emerging market equity and bond funds, the second largest outflow on record, according to data provider EPFR Global. Commodities, meanwhile, are likely to rise only when evidence of a sustained pickup in growth in the emerging economies appears, which is unlikely until the end of the year or 2015, in our view. Despite their nearly two-year weakness, we do not recommend overweighting them as an asset class. We do, however, continue to maintain a neutral weight to this asset class as a way to improve diversification. Finally, the arguments for diversifying into alternative assets, especially into funds in which managers can hedge against market volatility, strike us as being stronger than ever. 1 Michael Feroli, "US: Will Fed tapering lead to a repeat of the 1994 sell-off?" J.P. Morgan Global Data Watch, May 17, 2013. 2 The theory behind this indicator is the familiar discounted cash flow (DCF) model. A rise in interest rates will raise discount rates, but its effect on stock prices will depend on whether earnings, and by extension dividends, are growing or declining. 3Brian Gendreau and Leila Heckman, Fed Actions and Global Equity Returns, Heckman Global Advisors, May 18, 2004. Affiliates and subsidiaries and/or officers and employees of Cetera Financial Group or Cetera Financial Specialists may from time to time acquire, hold or sell a position in the securities mentioned herein.